It's a Mom Thing Reviews & More! 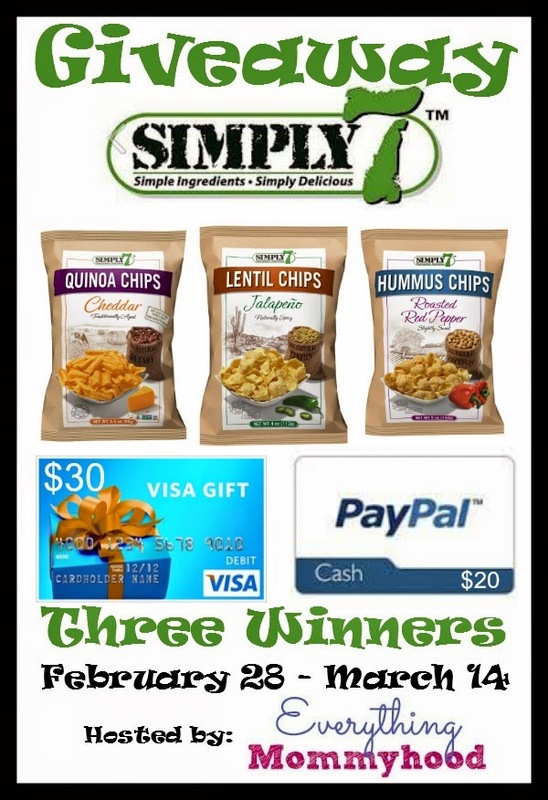 : Simply 7 Snacks Giveaway! They have 3 different products available - Quinoa chips, hummus chips, and lentil chips. Quinoa Chips are simply delicious, light, crunchy snacks that have 8-9 grams of protein per serving. Quinoa Chips come in Sea Salt, Barbecue, Cheddar, & Sour Cream and Onion. Hummus Chips are creamy, authentic hummus flavor with 50% less fat than potato chips. Hummus Chips come in Sea Salt, Roasted Red Pepper, Spicy Chili Pepper, & Tomato Basil. Lentil chips are a natural lentil flavor with 40% less fat than potato chips. Lentil Chips come in Sea Salt, Creamy Dill, Jalapeno, & Bruschetta. February is Heart Month, and while it's the end of February, we wanted to finish it off with a great product! You can make great choices when you snack, like Simply7 Snacks! You can purchase Simply7 snacks on their website or at a store near you! While at their website, make sure you check out the Snack Squad and you could get a personalized bag just for you! We will have THREE winners! Winners will be chosen randomly via the Giveaway Tools entry form and will be emailed. Winners will have 48 hours to claim prize before a new winner(s) is chosen. Giveaway ends 3/14/15 at 11:59pm Eastern. Disclosure: Everything Mommyhood received a case and monetary compensation for the posting of this giveaway. This blog was not compensated for this posting. All thoughts and opinions are those of our own and were not influenced in any way. Facebook, Twitter, Pinterest, Google, and any other social media are not affiliated with this posting or giveaway. Everything Mommyhood is responsible for the $20 PayPal while Simply7 is responsible for the other prizes. This disclosure is done in accordance with the Federal Trade Commission 10 CFR, Part 255 Guides Concerning the use of Endorsements and Testimonials in Advertising. If you have any questions about this event or would like to see your event hosted by Everything Mommyhood, please email EverythingMommyhood@gmail.com.